The Second Battle of Ypres was the only major attack launched by the Germans on the Western Front in 1915. 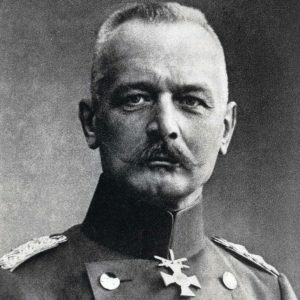 Eric von Falkenhayn, the Chief of the Imperial German General Staff, preferred to concentrate German efforts against the Russians on the Eastern Front. Second Ypres is generally remembered for the first use of gas on the Western Front. It had been introduced on the Russian Eastern Front by the Germans with minimal effect somewhat earlier in the war. Its use was in conflict with the Hague Convention which outlawed gas warfare. Its impact during Second Ypres was startlingly effective. In an effort to free up men from Western Front, and transfer them to the Eastern Front, Eric von Falkenhayn (pictured left) decided to attempt to take the town of Ypres. The attack was prepared but like the British, the Germans were suffering from a shell shortage of their own. At this point Falkenhayn was approached by Fritz Haber who was a chemist at the Kaiser Wilhelm Institute of Physical Chemistry. He explained that Germany, with its vast chemical industry, could manufacture chlorine gas in vast quantities which could be released on a favourable across No Man’s Land and have the same effect as an artillery bombardment. Despite the idea being opposed by his old school Prussian Generals, Falkenhayn thought this a good idea and pressed ahead with its use for the attack. Under the cover of the systematic destruction of the town of Ypres by the 96 of the notorious ‘Big Bertha’ howitzers, a total 5,700 canisters containing 168 tons of chlorine gas was brought into the front line and at 5:30pm on 22 April 1915 the gas was released in the northern sector of the salient. A French Algerian and territorial division occupied the trenches in the path of the gas and a veil of greenish-yellow mist could be clearly seen rolling across from the German front lines to their French positions. The effectiveness of the gas attack was so complete that it surprised the German infantry who followed the gas cloud wearing rudimentary gas masks. After firing into the cloud, the stunned troops fled in panic towards Ypres, the heavy gas settling and clogging the trenches where it gathered. The gas had affected some 10,000 troops, half of whom died within ten minutes of the gas reaching the front line. Death was caused by asphyxiation. Those who lived were temporarily blinded and stumbled in confusion, coughing heavily and 2,000 of these troops were captured as prisoners of war. A seven kilometre gap had now appeared in the Allied lines which the Germans paced wearily through. 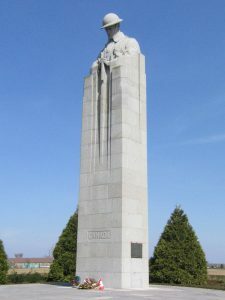 However, the Canadian First Division who were holding the line at St Julien were very quick to close this gap and a scrambled counter attack by British battalions of Smith-Dorrien’s Second Army stopped the German advance on Ypres after a three kilometre advance towards which captured high ground to the north of Ypres and significantly weakened the Allied position. The Germans released a second batch of chlorine gas two days later on 24 April and this was directed against Canadian troops situated north-east of Ypres and gained ground against the unprotected Canadian troops. The fighting was fierce and spread south as far as Hill 60. The novelty of gas warfare was wearing off, and the advancing German infantry sustained heavy losses from the defending Canadians, who were relieved by arriving British troops on 3 May. During this time the Canadians had suffered heavily, with 5,975 casualties, including 1,000 fatalities. General Smith-Dorrien proposed a two and a half mile withdrawal to bring the front line closer to Ypres. He felt that nothing short of a large-scale counter-offensive was likely to push the German forces back to their original positions. 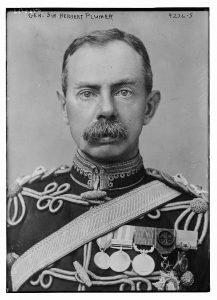 The idea was met coolly by the Commander-in-Chief of the British Expeditionary Force (BEF), Sir John French, who dismissed Smith-Dorrien over this suggestion. Ironically Smith-Dorrien’s replacement, General Herbert Plumer (pictured left, later famed for his successful Messines Offensive), also recommended a similar general withdrawal to Sir John. This time the suggestion was accepted, and French executed the planned withdrawal on 1-3 May after a failed Allied counter-attack by two divisions presided over by the French General Ferdinand Foch on 29 April. Fighting renewed around Ypres on 8 May and continued until 13 May and restarted again from 24-25 May, with repeated use of gas attacks. Still the Allied lines held, although German forces secured additional high ground to the east of the town from 8-12 May. On 24 May another heavy German assault forced a further Allied withdrawal, although little ground was ceded. Now a need for supplies and manpower obliged the Germans to call off the offensive and all that they could now do was to bombard the town. 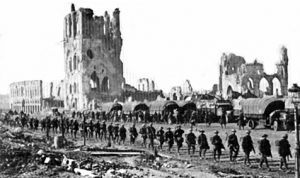 As a consequence of this by the end of the war, Ypres had been largely reduced to piles of rubble including the town magnificent Cloth Hall and Cathedral. The town would later be rebuilt in its former image in the years following the war (pictured right). Even so, the German attacks had considerably reduced the size of the Allied salient to three miles across and five miles deep and the losses for the Second Battle of Ypres are estimated at 69,000 Allied troops (59,000 British, 10,000 French) and 35,000 German, the difference in numbers is explained by the use of chlorine gas. The Germans’ innovative use of gas set the trend for the rest of the war. 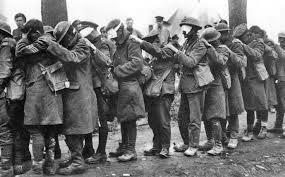 Although roundly condemned by the Allies as barbaric and reprehensible, sentiments echoed by many neutral nations, the Allies quickly developed their own form of gas warfare, with the British releasing gas canisters at Loos at the end of September 1915. All the allied countries had made extensive use of poison gas by the close of the war. 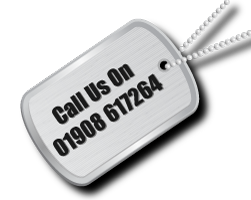 Or for more details of all our WW1 battlefield tours, call us on 01908 617264.